Navigation Planning best practice has recently come under the spotlight due to continuing airspace infringements and poor radio telephony (R/T) skills. Here at Easy PPL, in conjunction with the Easy PPL Navigation Flight Log, we have consolidated into one place below what we consider to be best practice when Navigation Flight Planning. If you are unfamilair with any of the terms or techniques described below, we suggest you might like to take a look at the Easy PPL Ground School Navigation Course where you will learn much more. This and other courses can be found at Easy PPL Ground School. When deciding on the track you are taking for each leg of the flight, don't be tempted to fly too close to controlled airspace. Even if you have a GPS, it does not take much to become distracted enough to fly off-track. By giving yourself an extra margin, (rather than trying to be clever and impress yourself with your flying ability), you'll avoid the embarrassment that ensues after the flight. If you're using a Lambert Conformal Conic projected map (i.e. a 1:500,000 chart in the UK), you should measure your True Track angle (with a protractor) half-way along each leg to minimise the error in the track bearing. The length of each leg needs to be long enough to ensure cockpit workload is not too great, but not so long that any error in navigation becomes difficult to manage. A good rule of thumb is for a track leg to be between 20 and 30 minutes flying time. You should at least have a half-way point on each track leg to allow off-track errors, drift assessment and ETA amendments to be easily made for the end of each leg. Thought should be given to you diversion airfield. Remember that a diversion airfield that is only a short distance away, whilst being good for the scenario of a sudden occurrence (such as the preceding aircraft on final approach to your destination having a problem), is not of any use if the weather closes in over a wide area. Your best option in a situation such as this is to plan for a diversion airfield far enough away to (hopefully) be subject to different weather. Having planned for a longer diversion, there wouldn't be an issue opting for a shorter one at the time for the "sudden occurrence" problem above! Fuel is the main consideration here, and is dealt with in one of the sections below. Yes, that's right we said Altitudes (plural). This is one of the best practice tips we have that is going to take any doubt away from the "should I continue" question. The Easy PPL Navigation Flight Log caters for this important aspect of navigation planning that is going to both keep you safe and out of trouble! You may need to split long legs into sections if there is a large variance for any of the calculated altitudes below. Technically "True Altitude" should be calculated in addition to those below. However, if good practice is observed, the correct QNH (or Regional Pressure Setting - RPS) used, and all figures are rounded up, this should be enough to counteract any deviance between indicated and true altitudes. Minimum altitude planning should be done in detail before flying! The minimum altitude should be a defined calculation, and should not include any "excess buffer" that can be eroded by a pilot under pressure who "knows" there is some "spare" built into the figure! Calculation of the minimum altitude should be done on a per leg basis as a minimum. To work out the minimum altitude, high ground, masts not shown on the chart, marked obstacles, and air law need to be taken into account. Determine the highest ground within 5nm of the track (including 5nm radius around the end). Allow for a 299ft mast that is not shown on the chart. Add the legal minimum of 500ft clearance to this figure (assume that you flew directly overhead the obstacle without seeing it from an air law perspective). Round up the figure to the next nearest 100ft. Determine the highest marked obstacle within 5nm of the track (including 5nm radius around the end). Add the legal minimum of 500ft clearance to this figure (assume that you flew directly overhead the obstacle without seeing it from an air law perspective). Round up the figure to the next nearest 100ft. In both of the scenarios above, care should be taken to ensure there is also sufficient clearance above high ground (mountains or large hills). This will depend to some extent on the wind speed, but over mountains, an absolute minimum of 2000ft above the peak is suggested. Take the highest figure of points 1, 2, and 3 above, and use this as the Minimum Altitude for that leg. This minimum altitude is an absolute, with no buffer. Therefore there is no concept of the pilot being tempted to be "just a bit lower". Strangely, the next step is to work out the maximum altitude for navigation. This takes into account any surrounding airspace that is (usually) above or close to the planned track. To determine the Maximum Altitude, study the map carefully and note the lowest airspace (that you have not planned to gain a transit clearance for) for each leg (or part thereof). Include airspace that resides less than 2nm from your planned track. Should this become onerous, you should alter your planned track to be further away from adjacent airspace! Now we have calculated the minimum and maximum altitudes, we can actually fly at any altitude between these. To select your best Navigation Altitude, you should take into account visibility, cloud base and wind direction (tail winds, or a component of them, are always welcome). Aim to select the highest altitude possible within these constraints to allow for easier navigation. If conditions change en-route, you know that you may navigate anywhere between your Minimum and Maximum Altitudes with safety. We try to emphasise that accuracy is a key part of navigation planning, since you are on the ground, and have time to do it. The more time spent planning, the easier it will be in the air, and less prone to mistakes. Even though (as a general rule) we operate as a General Aviation pilot, in the lower levels compared to commercial operations, altitude and temperature do make a difference between Indicated Airspeed (IAS) and True Airspeed (TAS). Navigation calulations should be performed with TAS as an input, and not IAS. For accurate planning then, we need to be able to calculate TAS. Several steps are required and the Easy PPL Navigation Flight Log prompts you for these calculations. For a given IAS, the Pilots Operating Handbook (POH) will show the Calibrated Airspeed (CAS). Pressure Altitude is the altitude that would be indicated by the aircraft altimeter when it is flying at your planned navigation altitude, but with the sub-scale set to 1013hPa. This is a simple sum that can be done by using a rough equivalence of 27ft per hPa when calculating. Armed with CAS, Pressure Altitude and the Outside Air Temperature (OAT) at the planned Navigation Altitude, the Pilots Flight Computer ("whizz wheel") can then be used to determine TAS, which is the correct airspeed to use in the navigation calculations. Not many VFR pilots take this into consideration - and they should! The Freezing Level is very straight forwards to find on the UK Met Office Form 215 (far right hand column) called "0 C" for the deliniated areas on the chart. The main reason for noting this is to re-emphasis the temperature at the selected Navigation Level, and to also be aware of where the Freezing Level is, if a climb is required for any reason. Additionally, if any ice is encountered for whatever reason, then how this is to be dealt with can at least be considered at the planning stage (e.g. if the Freezing Level is only 1000ft, a descent is going to have to be made below this level before the ice melts)! Even if the navigation flight is due to take place well before daylight fades, it is essential to know what time sunset is due to occur. Delays can occur for all sorts of reasons, from technical problems to waiting for fuel to settle in the airfield fuel tanks following a delivery, before the aircraft can be refuelled for the next navigation leg. Being armed with the information right at the start of the planning process is good practice from a Human Performance & Limitations perspective. The information has been highlighted to the pilot at an early stage - brought to the front of the brain - to ensure it is included as one of the fators when things start to depart from the carefully constructed plan. Once again the Easy PPL Navigation Flight Log prompts the pilot for this information at the planning stage. Based on the True Track, TAS, Wind Vector (direction and speed), and taking into account Magnetic Variation, a Magnetic Heading is calulated. Many Navigation flight Logs stop here. However, for the required increase in accuracy, we also need to take into account Compass Deviation (on a per aircraft basis). Compass Deviation may be as much as 3o. Many pilots will round up or down to the nearest 5o, and if the compass deviation is not accounted for, this could lead to a heading error of 7o before the aircraft even leaves the ground. The Easy PPL Navigation Flight Log prompts the pilot to calculate Compass Headings HDG(C) to take into account deviation. 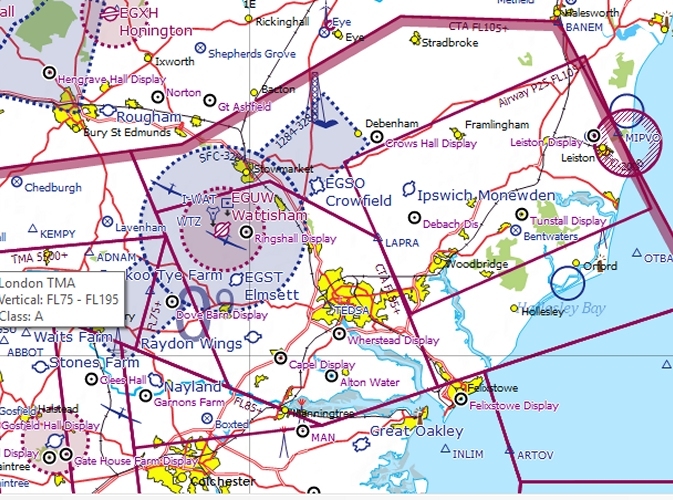 Additionally, before any heading rounding is incorporated, the proximity of controlled airspace to the track should be examined. To avoid infringements, best practice would be to "round" any headings "away" from that controlled airspace where possible. This is another area that historically has been subject to little guidance and even less prompting on many Navigation Flight Plans, even though it is a critical subject. As of 26th August 2016, even private flights are subject to EASA Operational Procdures contained in EASA.NCO and EASA.NCC documentation. These documents stipulate the legal requirements for fuel planning. We have extracted the information, and simplifed the many variances into a legal common sense approach for best practice, and this is described below. Determine the fuel required for the planned navigational flight (without diversion). Add contingency to (1) of 5% to allow for a fuel burn in excess of the stated POH figure or pilot operating error, or additional headwind components. Calculate the fuel required for the diversion. Determine the fuel required for initial taxi, take-off, climb to navigation altitude, descent from navigation altitude, circuit, approach, landing and final taxi. If figures are not readily available, a good rule of thumb is to allow for 15 minutes fuel at cruise burn rate. At the end of the flight (with the aircraft shut down on the ground), there must be a set amount of fuel remaining. For day-time flights this is 30 minutes of fuel at the cruise burn rate. For night-time flights, the requirement is for 45 minutes of fuel at the cruise burn rate. Add up items 1 to 5 above, and this is the minimum fuel required for the flight. This best practice fuel planning procedure is promted for in the Easy PPL Navigation Flight Log.